T-Shape Style Bowl. Catlinite with metal inlaid. E492. The styles of pipes in North America remained rather constant from around 40th century B.C.E. until 10th Century B.C.E. ; with tubular pipes being the most common. It was not until around 700 B.C.E. that a calumet style elbow pipe appeared. From that moment onward, pipes continued to change in style and shape, and eventually even purpose. For the Midwest, the most common material that the bowls of the pipes were made out of was catlinite. 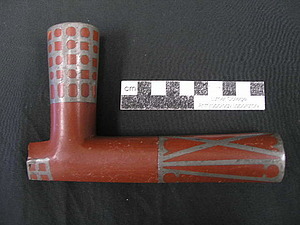 Some pipes from the Great Lakes area were inlaid with metal from mines. Black stone pipes were also common but were not collected as frequently due to their less vivid appearance. The stems were usually made of softer wood materials such as sumac or willow. Individually, each piece of the pipe has its own importance and symbolism. When separated, the pipe bowl and pipe stem have different meanings and significance. When the pieces are put together they form the pipe which then takes on new meanings. The stem's size and shape determines its purpose. Longer stems were used for group rituals and meetings, while smaller stems were used for leisurely activities. The stem is said to represent male energy as well as creative energy. Colors that are painted on the stems have many different meanings, too. When using the colors red, green, blue, and yellow, they typically depicted a certain direction (North, South, East, and West). Porcupine quills and hairs of various animals were typically woven around longer stems. Sometimes pendants or feathers were placed on the stem for ritual ceremonies. The pipe bowl on the other hand represents female energy. The red color, from materials such as catlinite, can represent blood or life. The shape of the bowl itself illustrates the female body as well as fertility and childbearing. Pipes were styled differently depending upon their use as well as their intended owner. Women’s pipes were generally smaller, with short stems and few decorations. Men’s pipes, for ordinary occasions, were slightly larger and better made than women’s pipes, but were still quite small. Ceremonial pipes or pipes made for chiefs were larger with long stems. They were elaborately decorated, with feathers or other ornaments attached. Long Style, Spiraled Stem. ca.1850-1900. Wood with red and green paint. Similar to Menominee Native American style. E496. One specific style of sacred pipe is the Calumet. It was generally made with red pipestone or limestone, with a larger and highly decorated stem. These pipes were considered very sacred and were not supposed to be put together unless by a religious leader in a specific ceremony. Each Calumet looks different, and can only be identified this way when used in a religious context. Other highly decorated pipes were mostly manufactured for tourists and were not considered sacred. Tomahawk Style Bowl. ca. 1850-1910. Decorated Catlinite. No evidence of use, most likely a tourist item. E512. There are six specific styles of pipes that have been found in the United States. Our collection includes many of the different styles. The elbow style pipe is one of the most common, and is simply a pipe that is bent. One subset of the elbow pipe is the effigy style, with a bent shape of an animal or human (object E886). The t-shape bowl is self-explanatory, with a straight piece followed by an inverted t-shape at the bottom (object E492). Our collection does not include the disc, circular, or straight style. The Keel Style has a short round base and tapers at the top. One unique version of the keel is the tomahawk style, which features a tomahawk weapon head as a bowl (object E512). The tomahawk could be used to cut as well as smoke from, but generally was used for more symbolic purposes than practical. Elbow, Effigy Style Bowl, ca. 1860-1920. Catlinite. Most likely tourist item. E886. The effigy style pipe bowl is a long standing and highly religious style. The animal depicted by the pipe bowl generally has a symbolic connection to the tribe it was used by. However, during the 19th century many effigy style pipes were manufactured for tourists and do not have the same spiritual implications. Pipes made for tourists were made in one single piece (stem and bowl connected), in order to distinguish them from sacred pipes, which were created in separate pieces. 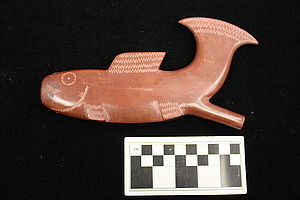 Eventually other tourist pieces were made as separate pieces to more closely replicate the Native American pipe, much like the fish pipe in our collection. Most sacred pipes were kept in separate pieces and in a pipe bag when they were not being used. 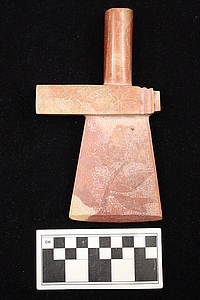 It was very important that the pieces of a Sacred Pipe were not connected after a ritual ceremony. The pieces were stored safely in an ornately decorated pipe bag in order to protect them. In some groups it was also important that the pipe bag was kept inside and away from the elements, since it contained very sacred items. Pipe Bag. ca. 1850-1900. Leather. Similar to Cree Native American style. E560.